Working together, we can help you learn the skills and habits to become ticket and collision-free for life. The listed driving packages will help the student to develop safe driving habits. Lessons are typically spread over five intensive lesson segments as the student is taught not only the fundamentals of defensive driving, but the Washington State Driving Practices as well. After the package of lessons, if the driver is not yet ready for the examination, individual lessons may be taken at the package rate. Please Note! If your schedule is limited, please call ahead before registering. We want to ensure you’ll be able get lessons in a timely manner. (425) 643-0116. For optimal results please use Google Chrome when registering. Includes 12 (1 Hour) Lessons, Knowledge test, and Skills test. Meet at our location. Does not include pick-up and drop-off. Includes 10 (90 minute) Lessons with pickup at your location. The pick-up and drop-off location must be within 5 miles and 10 minutes of the branch location selected. If additional travel time is required for an adult lesson, it will be deducted from the lesson time. The knowledge and skills tests do not have pick up and drop off. You will need to meet at our location for the tests. All driving lessons will have a pick up at the address provided upon registration. Includes 5 (1 Hour) Lessons. Meet at our location. Does not include pick-up and drop-off. Includes 5 (90 minute) Lessons. Meet at our location. Does not include pick-up and drop-off. Includes 10 (90 Minute) Lessons, the Knowledge test, and the Skills test (company vehicle). Meet at our location. Does not include pick-up and drop-off. Includes 5 (90 minute) Lessons with pickup at your location. The pick-up and drop-off location must be within 5 miles and 10 minutes of the branch location selected. If additional travel time is required for an adult lesson, it will be deducted from the lesson time. All driving lessons will have a pick up at the address provided upon registration. Defensive Driving School today is the combination of traffic safety programs which has a long history in the Seattle area. 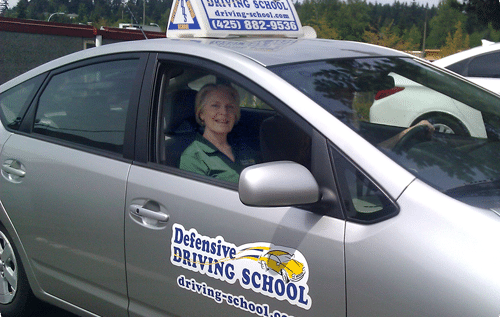 In 2001 Defensive Driving School joined forces with Seattle Driving School, the area's pioneer driving school being established in 1945. In January of 2006, Kirshner Driving School, which was formed in 1949, became part of the Defensive Family. By combining the experience and attributes of each program, we've come up with a curriculum that is 2nd to none. Defensive Driving School has more collective years of experience than any school in Washington.